An annual day of dancing, laughing, free food, games, music, friends, family and – most importantly – fundraising for Gillette Children’s Specialty Healthcare returns to campus Saturday, Feb. 24. “MAVATHON,” the culmination of a year-round fundraising effort by the Dance Marathon student organization, goes from noon to 10 p.m. in the Centennial Student Union. All proceeds support the Gillette Mankato Clinic. Feb. 24 events include free food from local restaurants, cosmic bingo, karaoke, billiards, bowling, a petting zoo, caricature artist, performance by the Maverick Machine Pep Band, a scavenger hunt and more. Registration for the event is $32 and can done by visiting www.msudancemarathon.com. Gillette Children’s serves families with children having medical conditions that are permanent and require lifelong care. It is affiliated with Children’s Miracle Network, which funds critical treatments and healthcare services, pediatric medical equipment and charitable care to local hospitals. 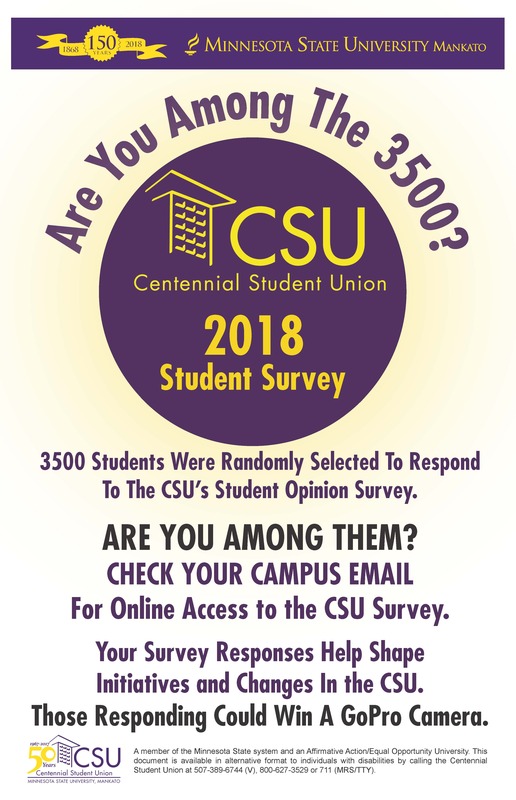 The Centennial Student Union seeks opinions, complaints, ideas and suggestions from 3500 Minnesota State Mankato students selected to participate in the CSU’s online 2018 Student Survey. Participating students were notified Monday by email when the survey officially launched. Reminder emails will be sent to encourage remaining students to voice their opinions before the survey’s March 1 conclusion. Survey participants could earn a GoPro Hero 6 camera being given away through random selection following the conclusion of the survey. In the opening email, CSU Director Mark Constantine shared a link to the survey and expressed the important role survey responses have in advancing the student union’s role as the students’ House of Serendipity. Of special importance is students’ response to questions crafted specifically for CSU services and programs. Celebrating its 50th year, the CSU seeks record student survey response in helping advance the future of services and programming within the CSU. 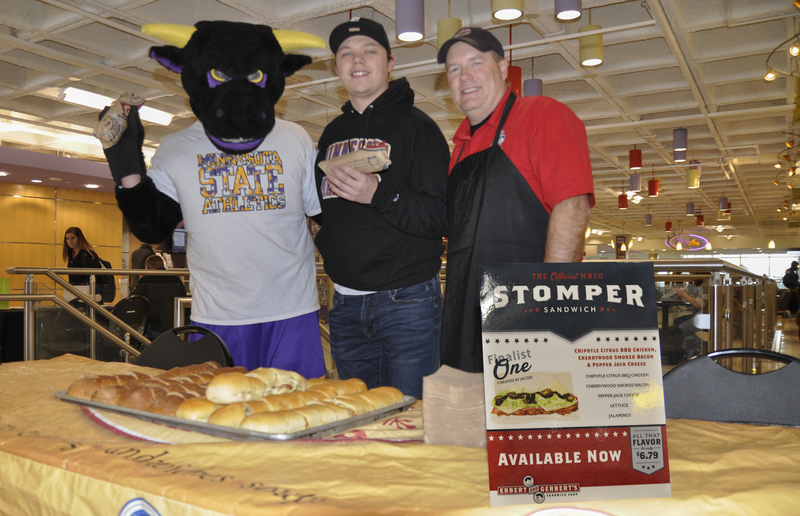 Stomper joins recipe creator Jacob Kuhlman and Mike Steindl, Erbert & Gerbert’s franchise owner, in unveiling the Stomper sandwich. The signature sub will be served exclusively on the Centennial Student Union E&G’s menu. Now Serving: Stomper…well, so to speak. And Jacob Kuhlman, a Preska Hall CA, is largely responsible. On Thursday, Erbert & Gerbert’s in the Centennial Student Union announced a new signature sandwich – the Stomper – served exclusively in the CSU. E&G’s official MNSU Sandwich was Kuhlman’s winning concoction from hundreds of recipes submitted in last semester’s “Create the STOMPER sandwich contest.” Mike Steindl, E&G’s franchise owner, said Kuhlman’s recipe – a chipotle citrus BBQ chicken sub complete with cherrywood smoked bacon, pepper jack cheese, lettuce and jalapenos – topped the list of three finalists in a student taste test conducted in the CSU. For his winning efforts, Kuhlman, a senior from Fairbault, Minn., receives free food for a year from E&G’s. Steindl said the Stomper is now part of the E&G’s CSU menu. 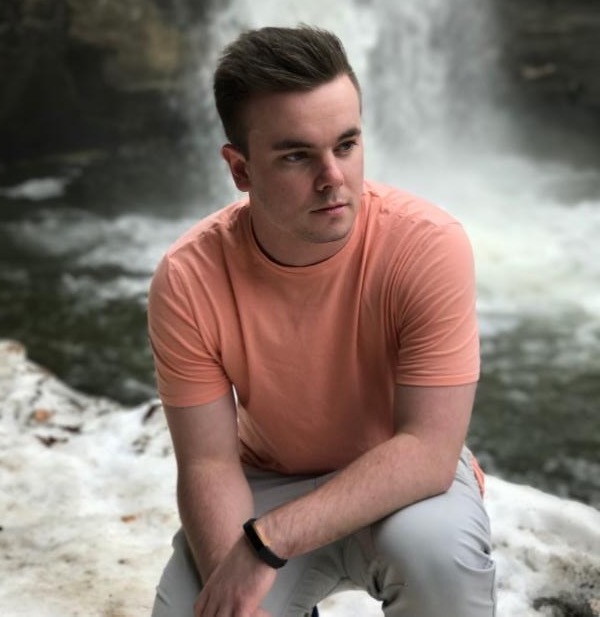 Brett Marshall is a Public Relations Intern with the Centennial Student Union Communications Office. Snow days are usually days when students celebrate and rejoice, but sometimes they don’t play out that way. Here are five horror stories college students have had on a snow day. 1. I forgot to check my email and ended up going to school. A truly horrifying realization. You put in the effort to get ready for the day and make your way to campus only to realize it was a ghost town. Now you must trek back through a blizzard and crawl back into your warm bed that you could’ve stayed in in the first place. 2. I still had to go to work. No school is great, but some people are unfortunate enough to have to go work. And aside from the extra cash in your bank account, it’s four to eight hours of maybe one to two customers coming through the door. 3. My snow blower didn’t work. There’s nothing worse than having a snow day and having the one thing you need to clear the snow break down. Usually a snow day means copious amounts of white fluff piling on up on your driveway or in your parking lot. You can’t ignore it, so instead, you have to invest all of your energy in shoveling in hopes that you’re able to get your car out, which leads me to the next horror. 4. Chipotle had BOGO, but my car was buried. The Madison Ave Chipotle had a BOGO Snow Day Special, but many students missed out on it due to their cars being buried under 13.5 inches of snow and treacherous road conditions. It was a rare occasion where Chipotle just wasn’t quite worth it. 5. I went into a ditch. Yep, it can happen to anyone. Sometimes you think you’re superman or you really wanted that BOGO Chipotle or had to slump your way into work. Whatever the reason, you found yourself in the wrath of Mother Nature’s blizzard. You’re taking extreme caution, but your car doesn’t care. You start to go around a curve and the next thing you know your car is in the ditch. You sob softly wishing you had just stayed home today wondering why you live in a place that gets so much snow. A candlelight memorial service honoring Patricia Miswa, a native of Kenya and Centennial Student Union Communications graduate assistant who died Jan. 4, will be Wednesday, Jan. 24, at 7:30 p.m. in the CSU Hearth Lounge. All are invited to attend to share in remembering the 32-year-old creative writing graduate student and globally-known “story-teller.” The memorial will offer time for personal reflections and placing of flickering candles around the Hearth Lounge fireplace. Anyone with photos of Patricia that they would like to share for viewing at the memorial are encouraged to send them to csuinfo@mnsu.edu or share on the Centennial Student Union Facebook. Arriving to Minnesota State Mankato this fall, Patricia joined the CSU staff and the Communications GA. Lenny Koupal, CSU communications coordinator, said Patricia’s graduate assistant application was a pleasant surprise. Patricia’s pursuit of a master’s degree in creative writing sought to fulfill her dream of being a “story-teller.” She had already made great strides toward that goal with her successful online magazine, AfroElle. Through her magazine she sought to illuminate the lives of African women who could serve as beacons of hope and inspiration for others. Her magazine’s global audience was evident by her Instagram account with more than 200,000 followers. “As an hommage to Patricia, we hope to create an online magazine with shared photos and stories about Patricia to share with her family, friends and followers,” Koupal said. According to Patricia’s mother, Josephine Ouma, an educational fund is being established in Patricia’s name. Koupal added that Patricia will continue as the inspiration and driving force for a new CSU Communications initiative. Anyone seeking more information should contact Lenny Koupal or the Kearney International Center at Minnesota State Mankato.